There’s a pretty great twist lurking around the halfway point of Thor: Ragnarok. The film’s funny, light-footed middle hour takes place largely on a crowded, colorful landfill planet called Sakaar, where the titular Avenger (Chris Hemsworth) is promptly captured and sold to The Grandmaster (Jeff Goldblum), an eccentric aristocrat who hosts regular death matches in a giant, Roman-style colosseum. To earn his freedom, Thor learns, he will have to best The Grandmaster’s star attraction, a long-undefeated champion who obliterates every opponent he faces, and whom the other characters speak of in awed, fearful tones. Ragnarok spends a solid half hour building up this mystery adversary—to say his reputation precedes him would be an understatement—until Thor, his hair cropped fashionably short and his face dabbed with war paint, steps into the arena, only to discover that the champion he is about to fight is none other than… [long pause for dramatic effect]… his Avengers teammate and frenemy, the Hulk. It’s a great reveal—or it would have been, if the audience didn’t see it coming long before they ever entered the theater. Ragnarok itself does nothing to tip its hand that Thor’s opponent is Bruce Banner’s radioactive rage monster alter ego, still mean and green two years after Age Of Ultron. It remains deliberately vague about the contender’s identity, resisting even telltale references to his iconic green pigment. But for that to work, you’d have had to completely ignore Marvel’s multimillion-dollar marketing machine, which made no effort to conceal it—rather, splashing his bulky physique (draped in gladiatorial garb, no less) across all promotional materials and most iterations of the poster, and sending Hemsworth and Mark Ruffalo on endless press junkets. What’s more, it also specifically spoiled Hulk’s big entrance, and Thor’s hilariously relieved reaction to it, by sticking it at the end of the teaser trailer. 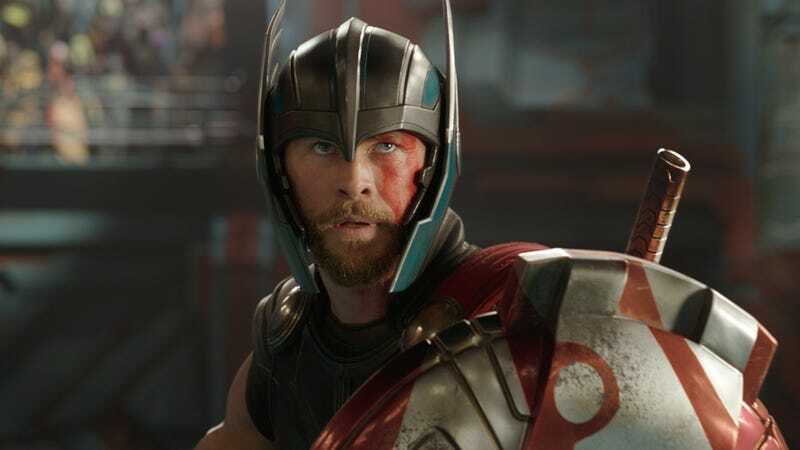 Marvel, in other words, did everything in its power to ensure that Ragnarok’s biggest surprise wasn’t one. As a rule, The A.V. Club isn’t especially spoilerphobic. To obsess over the strict preservation of plot details is to assume that story is the be-all, end-all of a motion picture—as if knowing some of what happens in a movie in advance somehow wrecks the entire experience, negating the need to see it at all. We’ve rolled our eyes at the intense secrecy of the J.J. Abrams school of movie advertising, and have certainly balked at studios’ demand that every single pertinent plot detail be left out of a review. (See, for example, Blade Runner 2049, whose makers insisted critics not disclose something the movie itself reveals within its first few minutes.) Just as reading a review before you see a film comes with the inherent risk of learning something you don’t want to know beforehand, watching a trailer will always prevent you from going into a movie completely cold. Of course, there are some who actively avoid these things, preserving the sanctity of a blank-slate experience. Surely, at least some of the many who trekked out to see Thor: Ragnarok this past weekend did so without having seen the trailers or even glanced at the posters, and for them Hulk’s introduction had all the impact the filmmakers intended. They would be in the minority, though. A studio like Marvel doesn’t take any risks with their mega-budget tentpole entertainments; they spend enough on marketing to make images of Thor and Hulk cosplaying as the cast of Spartacus almost inescapable. Actually avoiding seeing a too-revealing ad for Thor: Ragnarok might require such extreme measures as walking out of a movie theater when the trailers begin, or averting one’s eyes from billboards or passing buses. In this age of full-court-press movie awareness campaigns, going into a blockbuster blind practically requires locking yourself in a sensory deprivation tank. But what’s especially irksome about Marvel’s refusal to keep Hulk’s grand entrance a secret is how actively it seems to work against the aims of the movie itself. Ragnarok operates under the assumption that no one knows who’s waiting for Thor at the other end of the battle dome; it spends at least a good half hour building suspense before arriving at its pretty stellar payoff. But knowing where that whole stretch is leading—being well aware that folks are referring to Hulk the whole time—is like sitting through a long, elaborate joke when you already know the punchline. It undercuts everything the movie is trying to do. This is, of course, blockbuster business as usual; studios have been nervously spoiling their best twists for ages. One of the more famous—and detrimental—examples is Terminator 2: Judgment Day, which couldn’t resist revealing that Schwarzenegger’s relentless kill bot, the T-800, was the good guy this time, even though the sequel itself builds its entire first act around audience assumption that he’s out to kill the Connor family again. The scene where we learn the truth is a fantastic reversal of expectations—or, again, it would be, if Columbia could have kept its proverbial lips sealed. The marketing team let T2’s cat out of the bag because they knew that making Schwarzenegger the hero was a great hook; they just couldn’t resist exploiting that twist to put more asses in seats. That’s also the logic, presumably, behind Marvel’s indiscretion. Hulk is a fun, enormously popular character. To hide the fact that he shows up in Ragnarok is to all but assure a smaller opening-weekend intake. Likewise, Hulk crashing through the colosseum walls, and Thor excitedly reacting to it (“He’s a friend from work!”), is a funny stinger to end a trailer on—it promises a team-up fans have been waiting to see, while also capturing the movie’s loopy comic sensibilities. And hey, it worked: Ragnarok is a huge hit, and it opened much bigger than either of its predecessors. It doesn’t seem unreasonable to assume that the anticipation of Hulk’s appearance played a role in the movie’s success. So yes, it’s good business, as this weekend (and many others) demonstrates. But it’s terrible for storytelling. Is a few million more on opening weekend really worth spoiling your best plot twist? Keeping the Hulk under wraps—now that would have been incredible.